England’s cost effectiveness watchdog NICE can shift away from its current default of starting with a ‘no’ to new drugs, and then negotiating a deal with pharma companies – but requires greater co-operation from industry, according to its chief executive. 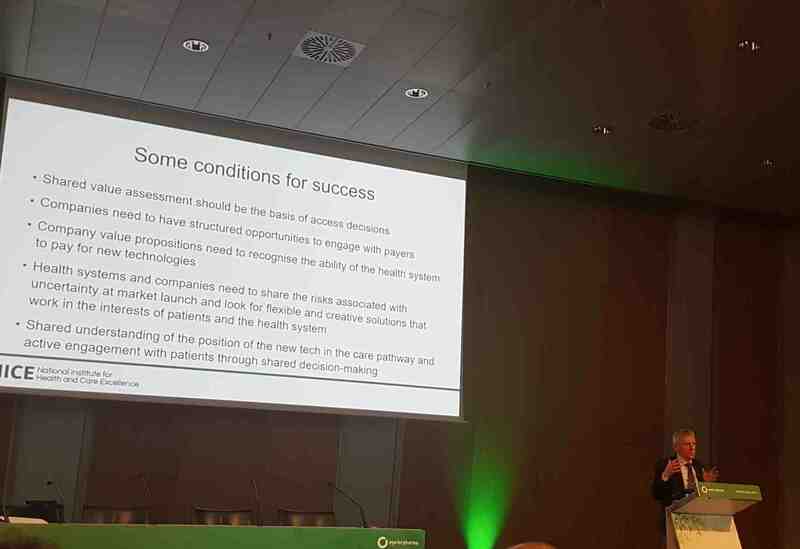 Speaking at the international pharma conference eyeforpharma Barcelona last week, NICE’s chief executive Sir Andrew Dillon struck a conciliatory note with his audience, making it clear he understood the sector’s need to provide shareholders with a return on investment on novel medicines. However, he cautioned that industry, healthcare payers and health technology assessment (HTA) authorities like NICE needed to do more to achieve ‘alignment’ on value, evidence and price for the sake of patients. He says that NICE’s closer working with NHS England, the budget holder for the country’s specialised medicines, has helped create a more joined-up market access system for the industry. Recent examples of this include rapid pricing deals on the two CAR-T therapies, Novartis’ Kymriah and Gilead’s Yescarta. However, even in these cases NICE started off with a draft appraisal rejecting the drugs as not cost effective. This is seen by both sides as a formality, which allows the next stage of pricing and access talks to begin – but finding a way to eliminate this initial rejection is seen as the next goal for NICE. “We want to turn that round so that by having conversations as early as possible, we can resolve much of the uncertainty around the evidence base,” he said. Dillon added that important factors in achieving this was a common view on value assessment and agreement on what the additional therapeutic benefits of a treatment are. Add to this openness and flexibility on accommodating uncertainties and risk-sharing, and he says discussions can proceed much more easily. The industry audience raised questions about NICE and NHS England’s long-running dispute with Vertex over its cystic fibrosis drug Orkambi, which is still not resolved after three years of appraisals and negotiations. Dillon said Orkambi was an exception to the industry norm, echoing remarks he made earlier this month at a parliamentary hearing. Not retreating from his earlier claims that Vertex had been exceptionally ‘inflexible’, he warned that patient group confidence in NICE process had been eroded by this row. “I think you [the industry] and organisations like NICE have a responsibility to foster a relationship that generates confidence among patient groups so that they believe that this isn't just a row that goes on until one side blinks, but that there's a constructive, repeatable approach." For its part, Vertex has counter-claimed that NICE's process and NHS England have been inflexible. While this row has been exceptional, this view has also been expressed elsewhere in the industry, and highlighted in a recent report by Map BioPharma. Dillon expressed optimism about NICE and the industry being able to work more closely together, and said NHS England’s emergence as the primary market access negotiator had helped generate “ever more complicated, arrangements for sharing financial risk”. Nevertheless, he said there remained a need for a more comprehensive solution to the challenges being presented by the new generation of medicines. This includes cell and gene therapies such as Novartis’ late-stage candidate Zolgensma, which the company has suggested could cost up to $4m per patient. Pharma companies and healthcare systems are exploring new approaches, including reinsurance schemes and ‘Netflix’ style subscription payments, which spread the cost of a curative treatment over a long period.